The following is one of my favorite posts from 2011. Thought it was appropriate to share with you one more time. Hope you have a great weekend! Being a former Army officer, the Army holds a special place in my heart. Additionally, they have been the premier leadership training organization in our country for the last couple of centuries. The Army has a simple, but profound model for leadership: Be – Know – Do. 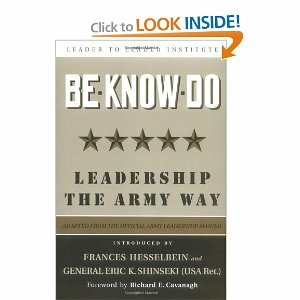 By the way, the Leader to Leader Institute (Peter Drucker) has published a great book on this called BE-KNOW-DO, Leadership The Army Way. Your mastery of the knowledge and skills required for your role are essential to the success of your organization. For me, it’s a great model of leadership. You can either order an actual copy of The U.S. Army Leadership Field Manual or the book on the model, BE-KNOW-DO, Leadership The Army Way. Hope you have a blessed day serving those the Lord has given you to shepherd at your place of work. We are literally on the same page on this, BG. I am currently reading the actual Field Manual FM 6-22 (formerly FM 22-100). I’d love to discuss with you this Field Manual, as you are a former Army Officer. Great – would enjoy talking. The Army was a great experience for me and very formative in my life. Just email me at ballen@lifeaction.org.